"Why social media integration matters?" is among most dubious questions. Today online merchants spend thousands just to put their online stores in front of shoppers` eyes. However, far not all retailers` goals and efforts are successfully achieved even if great sums on marketing are spent. This fact made us think of the two most popular ways that will solve the problem of your website invisibility. You`ll see that gaining traffic and driving profit are possible without putting much efforts and paying exorbitant price. Today, we'll reveal all the awesomeness of marketplace and social media integration. There is nothing new in the claim that a versatile eCommerce shopping cart is the key factor of prosperous retail. In terms of marketplace and SM integration, everything seems unchanged. Isn't it amazing if your platform gives you a chance to dive into rich SM benefits and enjoy the continuous flow of international audience? However, far not all the eCommerce engines can boast of the feature-packed functionality. That`s why, our task is to disclose the most prominent platforms that will make your business blossom. Before we begin, let's have a glimpse on some updated and relevant stats that will answer your WHYs. Based on getambassador.com research, 71% of consumers who have experienced good social media service experience are likely to share it with others. Doesn't it seem to be a fabulous chance to boost your brand engagement and gain new customers? As you can see, Facebook is the leader. Currently there are over 50 million businesses that use Facebook Pages to engage with their customers. And what's more, nearly 4 million of them pay Facebook for advertising. Being an online retailer, you can easily run product catalogs on Facebook. All you need is to add the necessary item information, manage orders and perform payment transactions right on the platform. Another Facebook huge benefit is Buy Buttons that build omnichannel ecommerce experience. Users start their purchasing procedure on social media and finish it on your website, which undoubtedly attract more customers. What's most essential, such functionality will simply provide a seamless shopping experience basically for everyone. 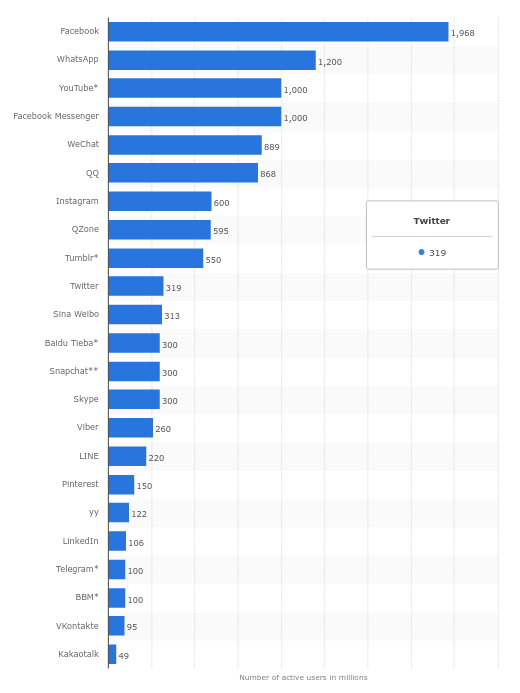 Regarding best social media networks for retail, it`s important to pay attention to such powerful SM channel as Twitter counting over 420 million active accounts. With the help of this SM channel, people can share your content in a flash. In return, you get more views and are likely to get more potential customers. Like Facebook, Twitter focuses on mobile advertising. Relying on numbers, mobile advertising revenue of 2016 was 88% of total profit of the company on advertising. Twitter is a starting point for 78% customers (dreamgrow.com) who are willing to unleash their frustration or ask questions. This is a good opportunity for you to keep up with all news and hot discussion and engage with prospects, customers and community in general. 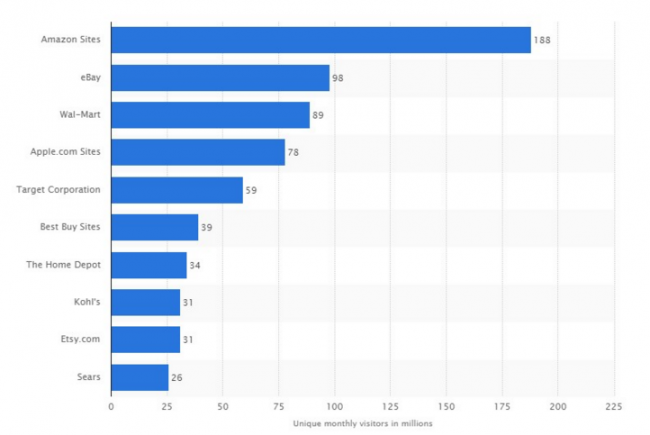 The next global social media we're going to talk about is Pinterest. It`s a home for nearly 81 percent of U.S. online consumers (digiday.com) who come here to find trustworthy information or ask advice. What`s more, in 2015, Pinterest launched Buyable Pins. 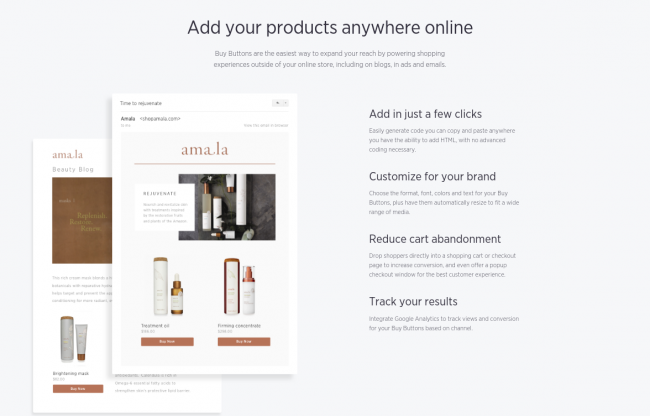 It means you can effortlessly pin your web store products and allow the customers to make purchases directly through Pinterest. Every merchant can measure and track the number of Pins, repins, and orders via your Pinterest Channel Dashboard. Currently, only three eCommerce platforms use Pinterest Buyable Pins. They are: Shopify, BigCommerce and Bigcommerce. However, these social media channels mentioned above don't seem to be only ways that help in boosting traffic to your website. According to BigCommerce, an effective eCommerce shopping cart, 45% of the whole sales are done through marketplaces. There is still much room for our discoveries. Marketplace integration: Why does it make sense? There are two most recognizable marketplaces you can benefit from: Amazon, eBay. If taking into consideration that Amazon is a starting point for over 36% consumers, eBay - 8% (BigCommerce stats), it makes sense to list your goods on them, doesn't it? There is one more recognizable marketplace that can help you boost revenue growth - Etsy. This is beautifully designed place for artists and crafters with a wide range of exclusive hand-made, vintage goods. Based on Etsy stats, currently it gathers 1.8 M sellers and 30.6 M buyers. After we have overviewed the world-known social media channels along with global marketplaces, we're finally going to uncover the most important part of our discussion. 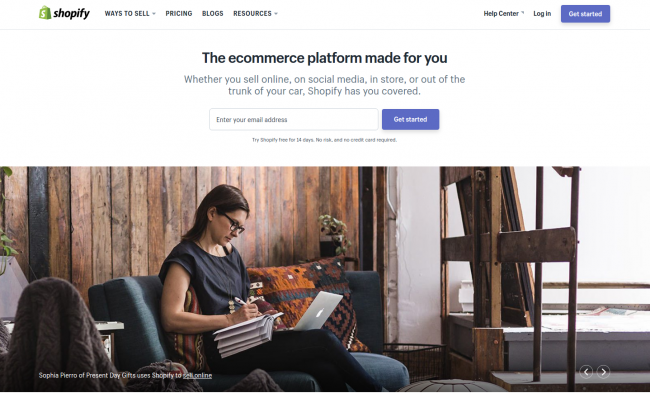 What is the best eCommerce platform with striking social network integration? 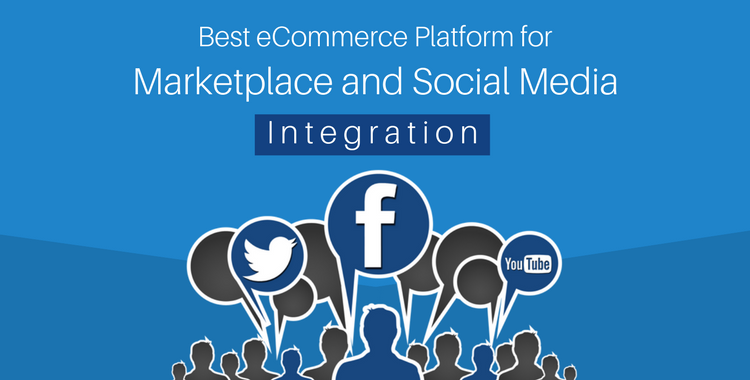 What Is The Best Ecommerce Platform For Social Media Integration? If you set up high business goals, targeted at larger business with the same customers` audience, the reliable way to boost traffic & sales to your store is to build it with already feature-rich solution. We did a research and can proudly name the list of evident representatives with outstanding social media integration. They are: Shopify, BigCommerce and PrestaShop. Shopify is an absolute winner in offering wide-ranging social media integration capabilities. One of its biggest merits is that it constantly grows its sales hub strategy allowing the retailers to sell on many sales channels at the same time. There are over 60 % merchants who run their stores on Shopify sell at least on two different channels. Regarding social media, it allows online store owners to connect and sell their products to millions of Facebook users. You can add your items to Facebook in one mouse click. You don't need to worry about product details, images, descriptions. They will sync automatically once you make an update in Shopify. The customers, in their turn, will check out without leaving Facebook, that is very comfortable. What is really awesome is that you can improve the customers’ shopping experience by means of Messenger. The clients will be able to purchase goods directly in a chat. It`s important to mention Shopify`s partnership with Pinterest. Thanks to Buyable pins, your customers can buy the items they want directly within Pinterest. Personally for you, it won't cause any inconvenience, you can track orders directly via Shopify Admin Panel. Speaking of marketplaces, Shopify integrates with Amazon, as we've already stated, world`s leading marketplace. Also, this fall Shopify is going to announce long-awaited eBay integration. This is a huge leap toward successful business. BigCommerce is another world`s respected shopping carts that competitively gains a striking popularity among store owners. This eCommerce shopping cart allows you to boost traffic and gain both local and international audience through SM channels. What`s worth mentioning is BigCommerceі social network integration with Facebook. All you need is to list your catalog, merchandise your products, select the checkout you want to work with. It terms of marketplaces, BigCommerce offers integration with Amazon and eBay. Just list your products on Amazon and eBay directly from the BigCommerce control panel, and start processing orders. What's more, BigCommerce allow clients to buy goods from your blog, social media posts, emails with the help of Buy Buttons. This is a great opportunity to expand your business reaching new qualified audience. PrestaShop is another powerful solution that is justly included in our list. Thanks to its successful combination of vast functionality and broad customization opportunities, it now makes up a solid army of users. Regarding social media integration, PrestaShop allows the merchants to connect their web stores with Facebook by means of Prestashop Facebook Login Connect module. It creates a special login button on your website allowing the users log in to your web site with their Facebook accounts. Like Shopify and BigCommerce, PrestaShop provides retailers with an advanced Amazon integration. To do that, you'll need to install Amazon Integration for PrestaShop plugin. Once the set up is over, you items will be assigned to this marketplace automatically. You can customize the products to your taste: edit prices, images, quantities, etc. The same goes with eBay Integration for PrestaShop plugin. With these both extensions you'll meet new customers to your beautiful store. Ecommerce social media integration: What`s the outcome? To sum up, there is no doubts that social media plays a crucial role in attracting customers and boosting sales. You win double if you decide to build your business with high-qualitative, feature-packed solution that will make your website recognizable among thousands. Hopefully, our list of solutions will be useful in decision making and will help the merchants who need continual growth and goal achievement. If your current e-platform doesn't offer you enough flexibility and such beneficial social media integration, Cart2Cart will gladly lend you a hand. ;) This world's leading shopping cart migration service will help you to migrate the widest range of entities to any of solutions mentioned above or 77 other shopping carts. Without tech skills and causing no harm to your existing store performance, you`ll get a full scale migration within couple of hours. If you have some questions, count on our 24/7 support team, they will provide you with the additional info ASAP. Choose the most prominent e-platform that suits your needs, start a Free Demo and conquer the eCommerce retail once and for all! 3 thoughts on "Best eCommerce Platform for Marketplace and Social Media Integration"
Nagaland, our team appreciate your opinion. Thanks. Thanks, Natalie. Glad you liked it.